WILTON, Conn.— With the press of a button, Richard Foster can make the world spin faster. Or slower. Or in reverse. Or back and forth. ”People ask me to do it all the time,” he says. Something there is, as Robert Frost would say, about modern architecture, especially here in the exurban environs of Fairfield County. Remember Phil Donahue, the TV star? Remember what he did last summer in nearby Westport when he got tired of looking at the nouveau-Flintstones-style house next door to his stately Tudor mansion? Right, he bought it. And tore it down. People here appreciate barns, not Bauhaus. Some residents even gush about the building as if it were the town’s own postmodern Monticello. ”I think of it as something very special,” said Sheila Wakoff, a real-estate broker. The excitement over the revolving house has subsided over the years. In the early days, gawkers would regularly gather outside. Some sightseers even rang the doorbell to ask for an unscheduled tour. Others, often finding the door unlocked, wandered inside on their own. ”Fortunately, we are pretty far from the road,” said Mr. Foster, a Greenwich-based commercial architect who designed the house and has lived in it with his wife and children since it was completed. 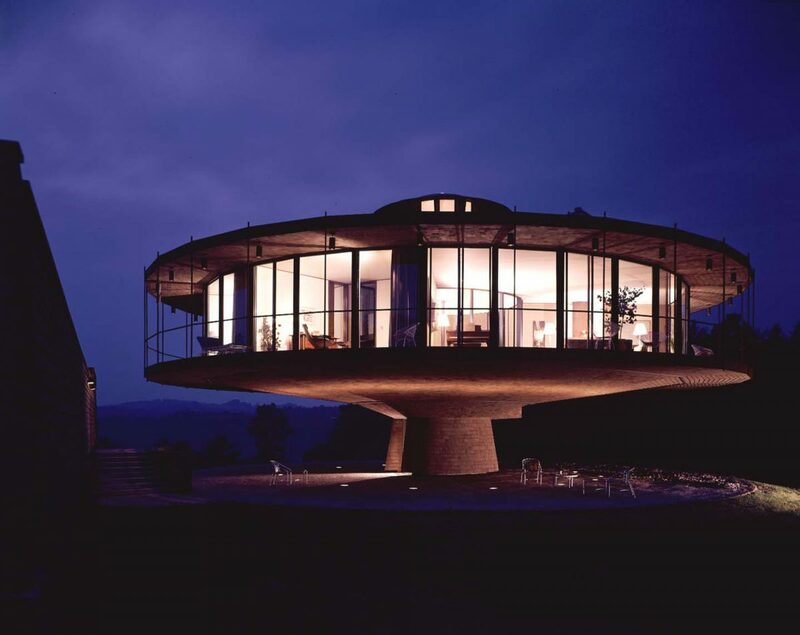 The eight-room structure of steel, wood and glass – one of only three known revolving houses in the world and the only one in the United States – sits on six acres and is conservatively estimated to be worth slightly more than $1 million. Mr. Foster, who credits the Space Needle at the Seattle World’s Fair as his inspiration, said he chose to build a revolving house because the views were too wonderful to be wasted on a stationary home. With a rotating house, he can spin at a maximum speed of one turn every 48 minutes. That works out to a little less than 0.05 miles per hour (one-twentieth of one m.p.h.). Not so fast that you have to grab hold of the Mies van der Rohe-designed chairs, but still quick enough to make an unwarned guest wonder about flashbacks or spiked drinks. The movement, generated through a one-and-a-half-horsepower motor and a 14-foot ball-bearing assembly, hardly puts a dent in the electricity bill, either. ”It’s no more than two refrigerators going,” said Mr. Foster, who invented the word ”circambulent” to describe his one-story, 72-foot-diameter home, which rests on a 10-foot-high concrete cone. The biggest problem comes when a stiff wind rips through the valley and provides a little friendly updraft. ”You do feel it,” he said. Aptly, just a few country roads away from Mr. Foster’s house lies New Canaan, where a generation ago Philip Johnson and a few creativity-crazed cohorts built some rather bizarre homes. Probably the most notable of their works is Mr. Johnson’s 40-year-old see-through house. It’s called the Glass House. It became part of the National Trust for Historic Preservation in 1986. And, like Mr. Foster’s home, it is praised more often than pilloried. Fortunately, neither one was built next to Phil Donahue’s house.